The vastness of the ocean and the secrets of the submerged landscape contribute to its mystery. Seawater is opaque to light beyond a few hundred meters' penetration. Hence, there are no mountaintops one can scale to directly gaze at vast expanses of the abyssal seafloor. As a student of marine geology, one of the first things to learn is how we know what we know about the shapes of coastlines and the seafloor. Browse through the following timeline of ocean exploration efforts to find out how humans have developed techniques for mapping coastlines and the seafloor. Around 300 BCE (Before Common Era), Alexander the Great compiled charts and documents about the oceans into the first library of marine science in Alexandria, Egypt. The library became a warehouse of ancient writings and ships' logs. The harbor remained a center for maritime studies for 600 years. At the library, Hipparchus developed a consistent orientation for charts by placing east to the right and north to the top. He also developed the division of degrees of latitude and longitude into minutes and seconds. Other scholars working at the library invented the astronomical, geometric, and mathematical basis for finding one's location on Earth using the positions of celestial bodies. By 600 CE (Common Era), Polynesians had colonized nearly every inhabitable island in the southern Pacific Ocean. Their navigation relied on observations such as wave motion against ships' hulls, flight tracks of birds, and distant clouds over potential land. The Chinese invented the rudder, watertight hulls, and sophisticated sails on multiple masts. The British Longitude Act of 1714 offered a large cash prize for anyone who could solve the "longitude problem." "To know one's longitude at sea, one needs to know what time it is aboard ship and also the time at the home port or another place of known longitude--at that very same moment. The two clock times enable the navigator to convert the hour difference into geographical separation. Since the Earth takes 24 hours to revolve 360 degrees, one hour marks 1/24 of a revolution or 15 degrees. And so each hour's time difference between the ship and starting point marks a progress of fifteen degrees of longitude to the east or west. Every day at sea, when the navigator resets his ship's clock to local noon when the sun reaches its highest point in the sky, and then consults the home port clock, every hour's discrepancy between them translates into another fifteen degrees of longitude. One degree of longitude equals four minutes of time the world over, although in terms of distance, one degree shrinks from 60 nautical miles at the Equator to virtually nothing at the poles. Precise knowledge of the hour in two different places at once - a longitude prerequisite so easily accessible today from any pair of cheap wristwatches - was utterly unattainable up to and including the era of pendulum clocks. On the deck of a rolling ship such clocks would slow down, or speed up, or stop running altogether. Normal changes of temperature encountered en route from a cold country of origin to a tropical trade zone thinned or thickened a clock's lubricating oil and made its metal parts expand or contract with equally disastrous results. A rise or fall in barometer pressure, or the subtle variations in the Earth's gravity from one latitude to another, could also cause a clock to gain or lose time." Excerpted from Longitude by Dava Sobel, Published by Walker & Co New York, N.Y.; Used with permission. In 1725, when fishermen could not "find" the seafloor, they assumed that the sea was bottomless. This highlighted the need for suitably equipped research vessels to map the seafloor. "The fishermen working on that slope where they are in the habit of finding coral at 150 and 200 fathoms (1 fathom = 6 feet), and their lines not allowing soundings in greater depths, imagine that the bottom cannot be found, and call it in their exaggerated jargon a bottomless abyss, impossible to be sounded. This idea entertained by people of experience in marine matters, as well as by the simple fishers, appears to be absurd, and founded merely on the fact that nobody has yet cared to undertake the trouble and expense required for such soundings, which according to all appearances will never be made unless some Prince orders for that purpose special vessels with suitable instruments." Excerpted from Histoire Physique de la Mer (1725) by Count Luigi Marsigli. Published by Doubleday & Company, Inc. Garden City, New York. p. 177. In 1768, Captain James Cook set out on an exploratory voyage around the world. His voyage produced highly accurate maps and charts of islands in the Pacific as well as reports on marine life, geological formations, and ocean floor types. In 1807, President Thomas Jefferson authorized the formation of an agency to survey the United States coastline. The United States Coast Survey's early efforts focused on coasts and harbors. Initial research efforts included studies of tides, the collection of bottom samples, and soundings to measure the depth of near-shore waters. The ocean bottom was thought to be very old. In 1832, a well respected geologist hypothesized that a wide range of the artifacts of past civilizations would be found on the seafloor once we had the technology to explore it. "It is probable that a greater number of monuments of the skill and industry of man will, in the course of the ages, be collected together in the bed of the ocean than will exist at any other time on the surface of the continents. " Charles Lyell in "Principles of Geology," 1832, as quoted in: Muckelroy, Keith, 1978. "Maritime archaeology," Cambridge University Press, London. p. 11. 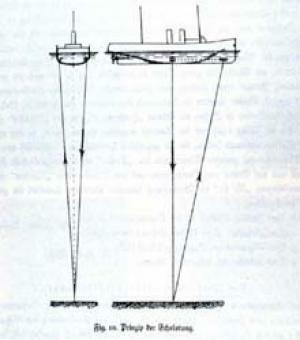 In 1840, a depth measurement (sounding) was taken with a line of 2,425 fathoms (14,550 feet). "On the 3rd of January, in Latitude 27 degrees, 26 minutes S., longitude 17 degrees, 29 minutes W, the weather and all other circumstances being propitious, we succeeded in obtaining soundings with two thousand four hundred and twenty-five fathoms of line, a depression of the bed of the ocean beneath its surface very little short of the elevation of Mount Blanc above it." Sir James Clark Ross, in command of Her Majesty's ships Erebus and Terror, en route to the Antarctic continent. This was the first successful deep-sea sounding ever taken. As quoted in "The Sea Around Us" (1951) by Rachel Carson. Published by Oxford University Press, New York. p. 56. In 1867, deep dredge hauls yielded baskets full of living creatures. This disproved the common belief that the sea floor was void of living organisms. 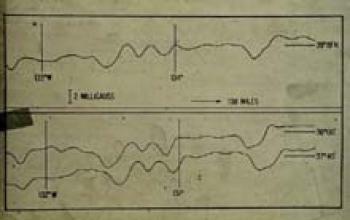 One of the earliest diagrams of echo-sounding in a published work. Source: F. Spiess' Die Meteor-Fahrt Forschungen, The Meteor Expedition (1928) by F. Speiss. Echo sounding was invented. This technology measured the depth of the seafloor by generating sound pulses and measuring the amount of time they took to reflect back from the ocean bottom. "Depth determinations by means of reflected sound from the bottom are reported to be feasible; and though it may never supplant the standard method of sounding, there is a possibility of it becoming a valuable supplementary device." In "Mapping the Pacific - Survey of Shoreline and Coastal Waters" by Commander J.T. Watkins, U. S. Coast and Geodetic Survey. Published in The Proceedings of the First Pan-Pacific Scientific Conference, August 2-20, 1920 (1921). Special Publication Number 7, Part 1, 1921 by the Bernice P. Bishop Museum. In 1960, two men in a manned submersible visited Earth's deepest ocean depth in the Marianas Trench. On January 23, 1960, the bathyscaph (a manned submersible vessel) Trieste reached the greatest oceanic depth known to exist on our planet. Jacques Piccard and Lieutenant Don Walsh of the United States Navy piloted the Trieste to the sea floor in the deepest part of the Marianas Trench, known as the Challenger Deep. Here is Jacques Piccard's description of what he saw on this dive to the deepest part of the sea. "The bottom appeared light and clear, a waste of snuff-colored ooze. We were landing on a nice, flat bottom of firm diatomaceous ooze. Indifferent to the nearly 200,000 tons of pressure clamped on her metal sphere, the Trieste balanced herself delicately on the few pounds of guide rope that lay on the bottom, making token claim, in the name of science and humanity, to the ultimate depths in all our oceans - the Challenger Deep. "The depth gauge read 6,300 fathoms - 37,800 feet. A major development of the 1950s was the invention of the Precision Depth Recorder (PDR) at the Lamont Geological Observatory of Columbia University. A recording from the Precision Depth Recorder. The Precision Depth Recorder instrument measured depths with errors of less than 1 percent of total water depth. The PDR was used to discovered abyssal plains-the flattest places on Earth-and the Mid-Atlantic Ridge Rift Valley. The discovery of a rift valley in the center of the mid-Atlantic ridge was one of the most important bathymetric discoveries ever made for developing the theory of plate tectonics. However, the discovery and its significance was not recognized for a year. Show me an account from "The Mid-Atlantic Rift Valley as Girl Talk"
In 1952, Marie Tharp was a draughtsman for Bruce Heezen and others working at Lamont Geological Observatory in New York. Bruce Heezen related the following story. 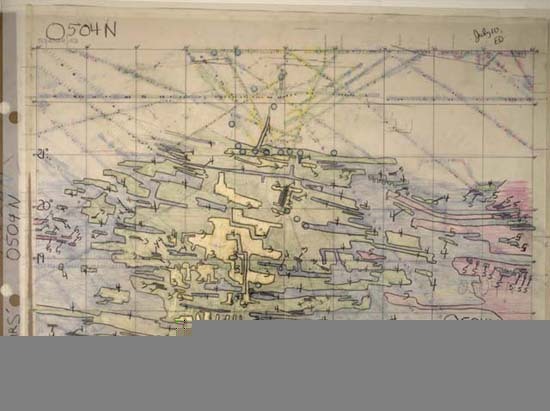 "Marie's job for me was to decide what a structure was--whether a rise in the echo soundings represented a hill or something longer like a ridge-and to map it. In three of the transatlantic profiles, she noticed an unmistakable notch in the Mid-Atlantic Ridge. She decided they were a continuous rift valley and told me so. I discounted it as girl talk, and didn't believe it for a year." As quoted in The Floor of the Sea (1974) by William Wertenbaker. p. 144. Marie Tharpe's rendering of the data showing a deep rift down the center of the mid-Atlantic ridge. The three great tools of ocean exploration were invented in the '60s: the Deep Tow instrument system, multibeam sounding instruments, and research-capable manned submersibles. The first Deep Tow instrument system was developed by Scripps Institution of Oceanography. It was tethered to a surface vessel then lowered and towed along just above the seafloor to collect and record information. The original Deep Tow system was designed to obtain seafloor slope information. Ultimately, it evolved into a system with multiple sensors for characterizing the deep-sea environment. 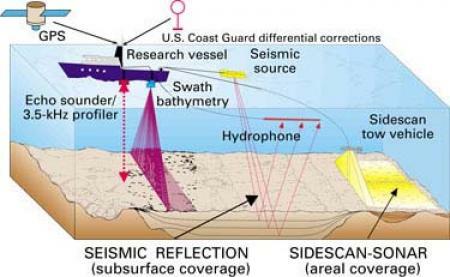 Instruments include a downward-looking narrow-beam sounding system, a sidescan sonar system, television and still-camera systems, and a variety of other sensors and sampling devices. 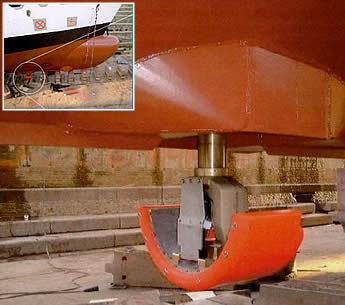 Bottom-mounted acoustic transponder navigation instruments were developed to support the navigation of the Deep Tow instrument within a study area. Virtually all deep-towed instrument packages trace their development history to the Scripps system. Multibeam sounding instruments that collect depth information along a swath of the seafloor instead of along a single line were the second major development of this period. The first multibeam sounding system, known as the Sonar Array Sounding System (SASS), was installed on the U.S. Navy Ship Compass Island in 1963. Multibeam sounding arrays, coupled with accurate navigation methods, allow the immediate generation of sea-floor maps. Multibeam sounding systems are the most commonly used instruments for most modern-day bathymetric mapping efforts. Improvements to manned research submersibles opened new worlds to human view. 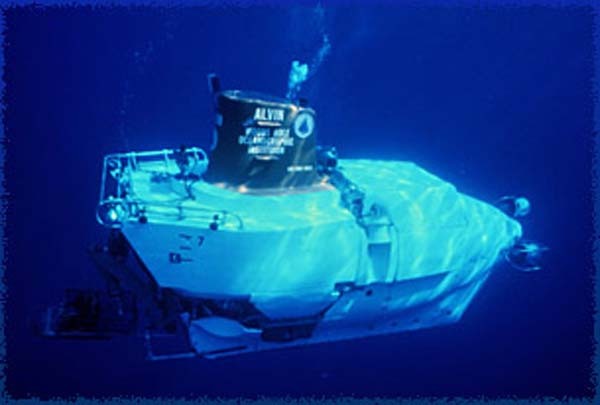 The Alvin submersible allowed scientists to explore ocean ridge systems. There, they discovered previously unimaginable communities of life that draw nourishment from the mid-ocean ridge environment. The bathyscaph, Trieste, was ill-suited to the needs of research scientists. Consequently, the Navy funded Woods Hole Oceanographic Institution to design and build a small research submersible. In 1964, the now-famous Alvin was launched and began its career of unparalleled oceanic research and exploration. 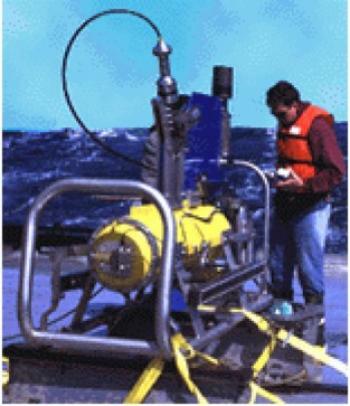 The U.S. Geological Survey collects data from a variety of instruments to map the sea floor and its underlying geology. (Image provided by USGS). Detailed satellite measurements that show small differences in ocean height have enabled scientists to develop a large-scale map of the ocean floor for most of our planet. Areas where sea level is consistently higher than average are the result of gravitational concentrations; these are caused by features such as mountains. Similarly, areas with lower than average sea levels indicate depressions on the seafloor. 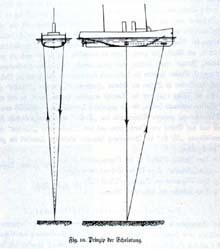 Shipboard depth measurements are used to constrain and correct the satellite data. Though this method does not provide the same level of precision as ship-based measurements, it does enable us to visualize the solid outer shape of the most of the planet. ... We visualize the hidden seascape with digital data sets, picture element by picture element, as tiles of a growing quilt, each stitched in the course of month-long expeditions.